USAG Kaiserslautern is the largest American military community outside the United States with more than 50,000 US citizens and is expected to become even more important under current transition plans. It is slated to be the logistics hub, and one of just four main operating areas left in USAREUR after the plans are completed. The American military is an important industry in the area. There was little reconstruction and a slow economy following World War II. Then, in 1952, the Americans moved in bringing money to the area. Since then the city has been almost totally rebuilt. Kaiserslautern annexed several surrounding villages in 1969 and now its population is approximately 100,000. It prides itself on having one of Germany's major league soccer teams. 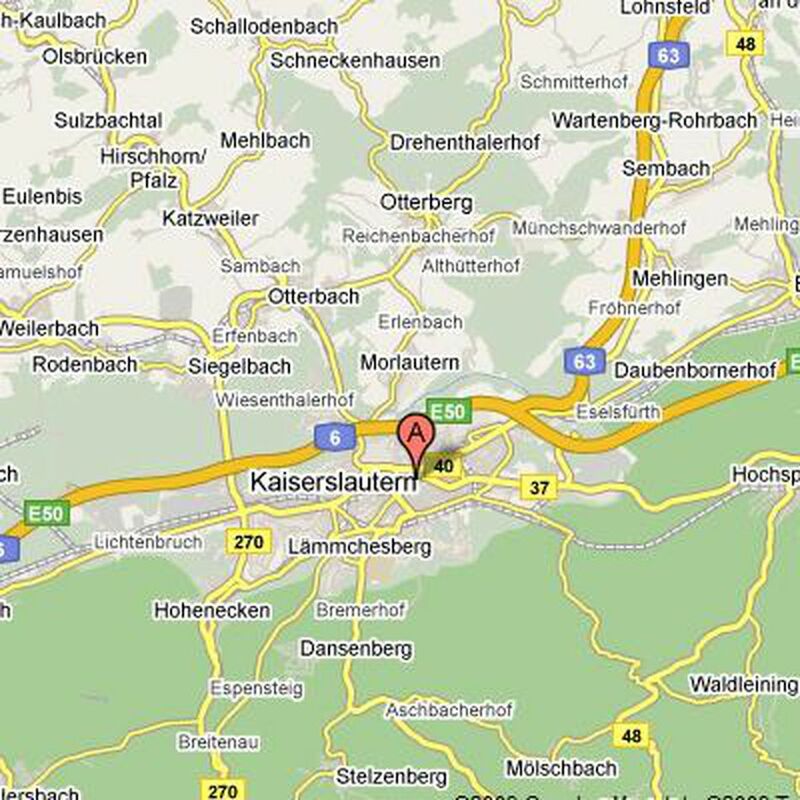 Kaiserslautern is 80 miles southwest of Frankfurt, Germany and 295 miles northeast of Paris, France. If you come into the new terminal, Terminal 2, you must take the "Sky Line" tram over to Terminal 1. You will exit the customs area into Hall "B" or "C" of the arrival deck. There is a staffed military information booth in the middle of Hall "B". In Hall "C" there is a United Service Organization (USO) lounge. The USO has coffee, papers, telephones, and personnel to assist new arrivals. The USO phone number: if calling civilian from the United States, call 011-49-6969-1581 or DSN 314-320-3530. If calling civilian from within Germany, call 06969-1581 or DSN in Germany 320-3530. When departing Frankfurt IAP, follow signs for A5 toward Basel or Darmstadt. Look to signs for A67 get in the center/left lane, and follow A67 (Left Split). When you pass the town of Lorsch, you will take the exit on the far right for A6 Mannheim, Kaiserslautern, and Saarbrucken. Once on Autobahn 6 (A6) in the direction of Saarbruecken. Take the Autobahn exit Kaiserslauter West and follow the signs to Opel and Waldfischbach on B270. Stay on the main road, drive over the bridges until you get to a red light. There turn right and drive through the entry gate to Vogelweh. USAG Kaiserslautern is the largest American military community outside the United States with more than 50,000 military members, family members, and DoD civilians. Kaiserslautern is the home of the 21st TSC which is the largest forward-deployed logistical command in the United States Army. Arrangements for temporary lodging can be made prior to your arrival at USAG Kaiserslautern by your sponsor at the Ramstein Inns Lodging facilities or hotels on the economy. You can reach Ramstein Inn Central Reservations at 011-49-6371-47-4920, DSN 314-480-4920. Housing in the KMC is scarce, therefore, concurrent travel is discouraged, especially for families requiring large apartments with four or more bedrooms. The projected waiting time for Government Quarters is anywhere from 0-12 months. The Ramstein Inns consist of five Inns located on four distinct installations supporting the entire KMC. We have two Inns on Ramstein Air Base, Ramstein Inns-Ramstein (formerly Northside, Southside, and Prime Knight) and the Gen Cannon Hotel, plus Inns on Sembach Annex, Landstuhl Post, and Vogelweh Housing Area (Ramstein Inns-Sembach, Landstuhl, and Vogelweh, respectively). If you desire to live in government quarters, submit an advance application through your Housing Office along with your PCS orders. Your name will be placed on the Waiting List effective the day you clear your previous duty station. Government Housing is offered in three different locations: Vogelweh, Ramstein and Landstuhl. The housing consists of 3 and 4 story multi-unit stairwell buildings and townhouses. All units have 110 and 220-volt electrical outlets, built-in dishwasher, mini-blinds, or rolladens and ceiling fans. Townhouses have small private yards and an attached garage. There is a two pet restriction. Schools and playgrounds are located throughout the housing areas. All service members are entitled to a 100 percent advance of required up-front rent payments and security deposits. Service members must pay back the advanced rent in 12 monthly payments. They may request to have repayment of the security deposits over $500 suspended until termination of the rental contract. Upon termination, of the contract, the member is required to repay the full amount of the security advance. The Dormitory Reception Center staff assigns and terminates rooms for single unaccompanied E-1-E-4 (under three years of service) personnel. The DRC is located in Bldg 2413, Room 175, Ramstein AB. Telephone - DSN: 480-DORM (3676). Child & Youth Services offers three center-based child care programs located at Kleber, Landstuhl, and Miesau; one School Age Services program at Landstuhl and one Middle School/Teen Center. The Youth Sports & Fitness and Instructional Class programs are located on Landstuhl Post. The Child/Youth Liaison Education Outreach Services office on Pulaski Barracks provides a variety of services to include enrollment for Army child care services, resource, and referral to other child care options in the community, volunteer services, and babysitter referrals and training. New and currently enrolled patrons must complete and update registration annually through the Central Enrollment & Registration Office, Bldg. 2898, Pulaski Barracks. Call DSN 493-4516 / 4122 or CIV 0631-3406-4516 / 4122 for more information. The USAG-Kaiserslautern Child and Youth Services Division are committed to providing quality child/youth programs and maintaining the highest standards. All of the USAG-Kaiserslautern Child and Youth programs are certified with commendation by the Department of Defense and are accredited by the National Association for the Education of Young Children (NAEYC). Children in the fifth grade and below require adult supervision. Children in the sixth grade and above may be left alone and may babysit siblings if they have ready access to adult supervision. Children in the seventh grade and above may babysit siblings if they have ready access to adult supervision. Subordinate commanders may supplement this policy with local guidance. Full Day is offered and based on total family income. Hourly care is offered 6 weeks to kindergarten at $4.00 per hour. Special needs care is offered. Air Force Child Care fees vary slightly from Army Child Care fees. All schools are located near government housing areas. The school in which your child/children attend classes depends on where you live. Students who live on the base walk to school; all others ride the bus. Kaiserslautern Middle and Ramstein American Middle School have an inclusive academic and vocational​ education programs. The core program is supplemented with study skills and exploratory opportunities consisting of computers, industrial technology, art, home economics, intercultural/German, band, keyboarding, and chorus. Kaiserslautern and Ramstein High School offer a full range of academic, career, vocational and fine arts classes. They also provide extra-curricular programs. There are several Private schools in the area. You may also choose to enroll your children in German schools. The KMC Christian Home Educators Group support home education in Germany. Landstuhl Regional Medical Center (LRMC) has a total of 8 outlying health clinics, 150 operating beds. LRMC is the largest Healthcare Center in Germany. Not only does this facility provide care for the Kaiserslautern Military Community, but also for Department of Defense families all over Europe, the Middle East, and Africa. Personnel assigned in the KMC have the most comprehensive level of US military medical care available in Europe. The KMC is primarily served by Landstuhl. Under TRICARE, there may be occasions when you are referred to a German Health care provider. The German health care system is a quality system with highly trained providers. The medical center can be found from Kaiserslautern by driving west on Autobahn 6 (A6) to the Autobahn 62 (A62) Pirmasens exit. On A62 go two exits up to the Landstuhl/Atzel exit. You will see a black and white sign stating "U.S. Hospital" get off at this exit and turn left at the stop sign. Follow the signs to gate #3. Military Sick Call is by appointment only at DSN 314-486-8758/8759, Monday through Friday from 6-7:30 am. The Family Practice Clinic is located in Wing 1A and is open from 7:30 am until 4 pm. The Family Practice Clinic is open to active duty family members and full pay patients. To book appointments, call the Family Practice Clinic at DSN 314-486-7707. Full pay patients must report to Ward 15b to obtain Form 600. If you are a full pay patient, you must have this form to be seen by clinic staff.